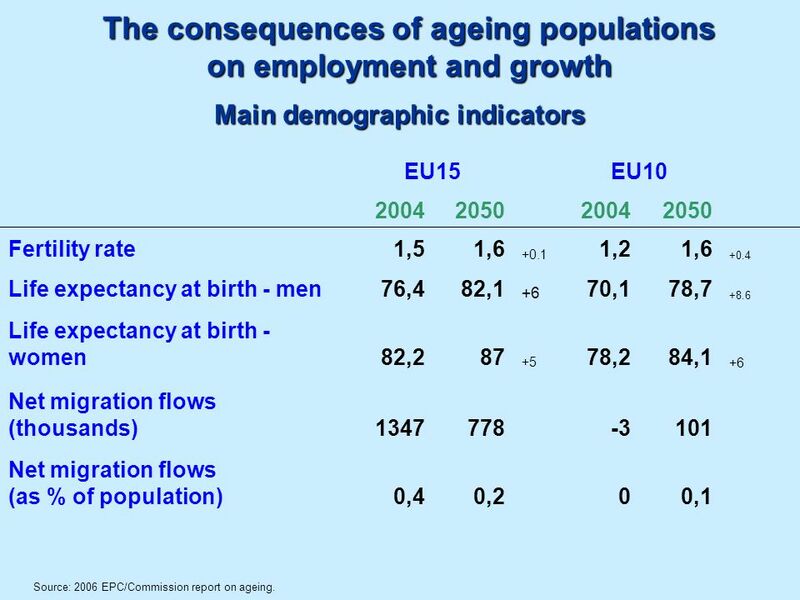 Main demographic indicators EU15 EU10 2004 2050 Fertility rate 1,5 1,6 +0.1 1,2 +0.4 Life expectancy at birth - men 76,4 82,1 +6 70,1 78,7 +8.6 Life expectancy at birth - women 82,2 87 +5 78,2 84,1 Net migration flows (thousands) 1347 778 -3 101 Net migration flows (as % of population) 0,4 0,2 0,1 Source: 2006 EPC/Commission report on ageing. 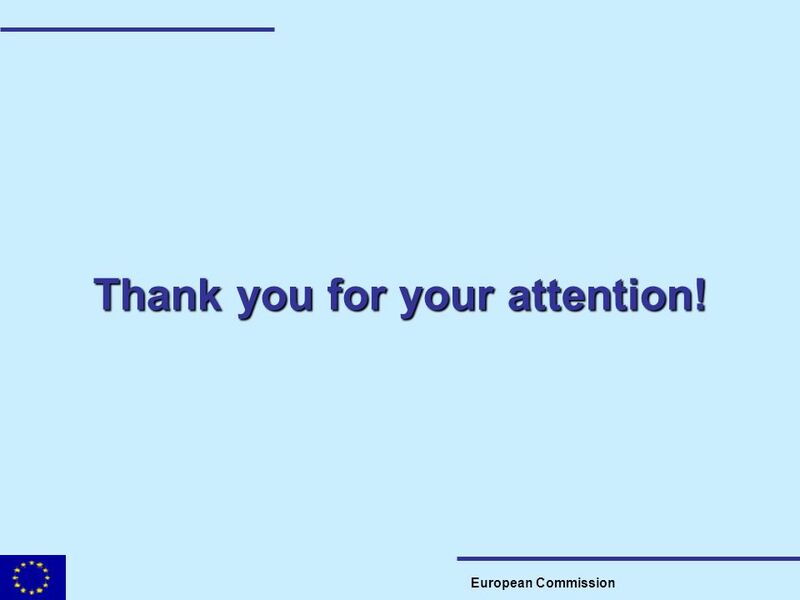 Total population: 457 mill. 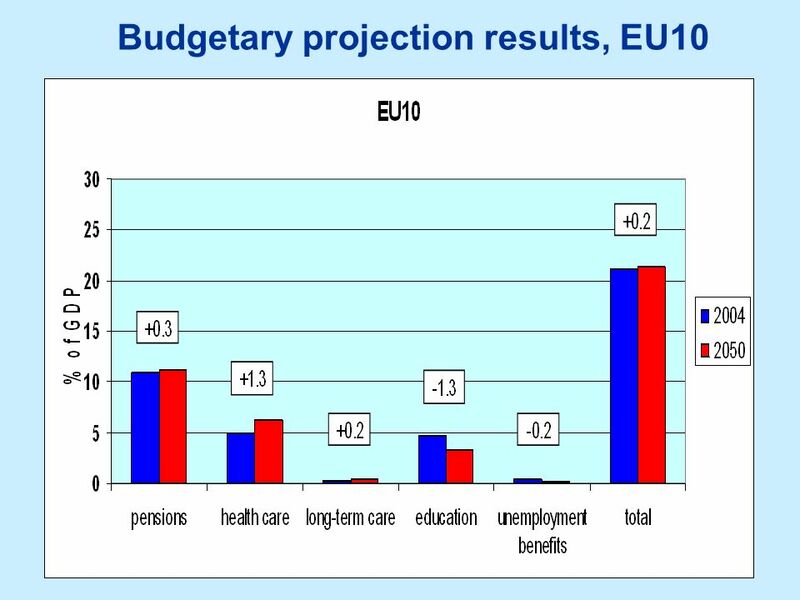 in 2004, 471 mill. 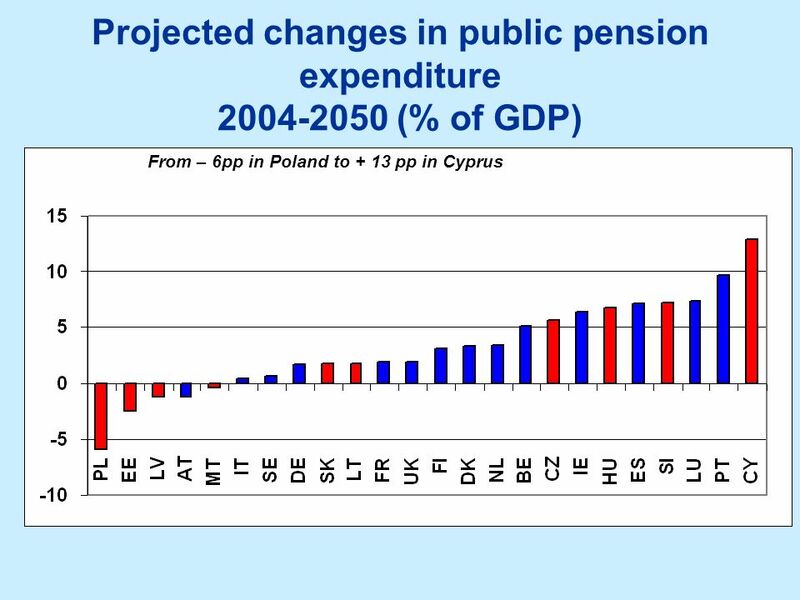 in 2030, 454 mill. 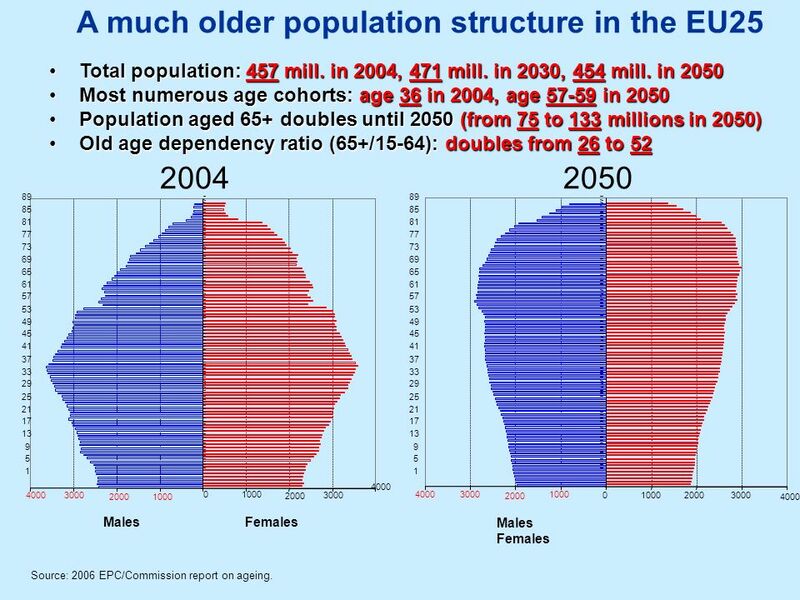 in 2050 Most numerous age cohorts: age 36 in 2004, age in 2050 Population aged 65+ doubles until 2050 (from 75 to 133 millions in 2050) Old age dependency ratio (65+/15-64): doubles from 26 to 52 2004 2050 89 89 85 85 81 81 77 77 73 73 69 69 65 65 61 61 57 57 53 53 49 49 45 45 41 41 37 37 33 33 29 29 25 25 21 21 17 17 13 13 9 9 5 5 1 1 4000 4000 3000 2000 1000 1000 2000 3000 4000 3000 2000 1000 1000 2000 3000 4000 Males Females Males Females Source: 2006 EPC/Commission report on ageing. 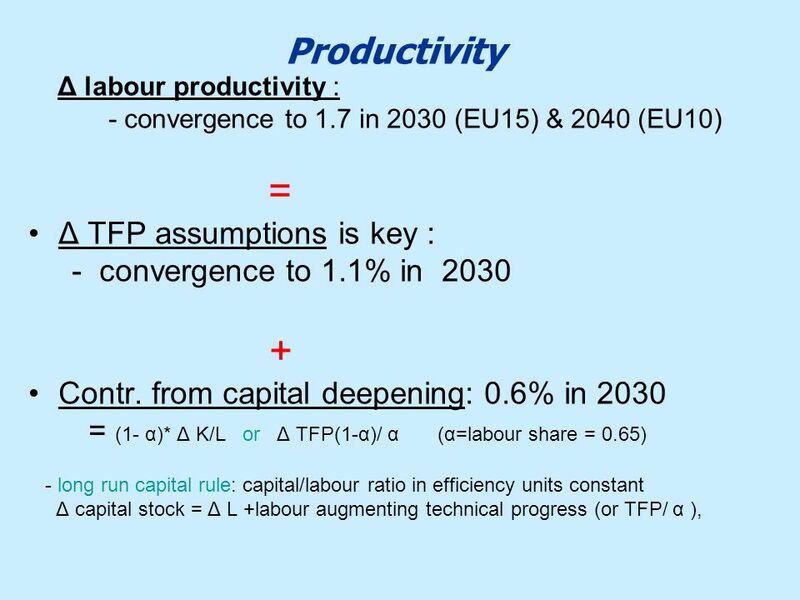 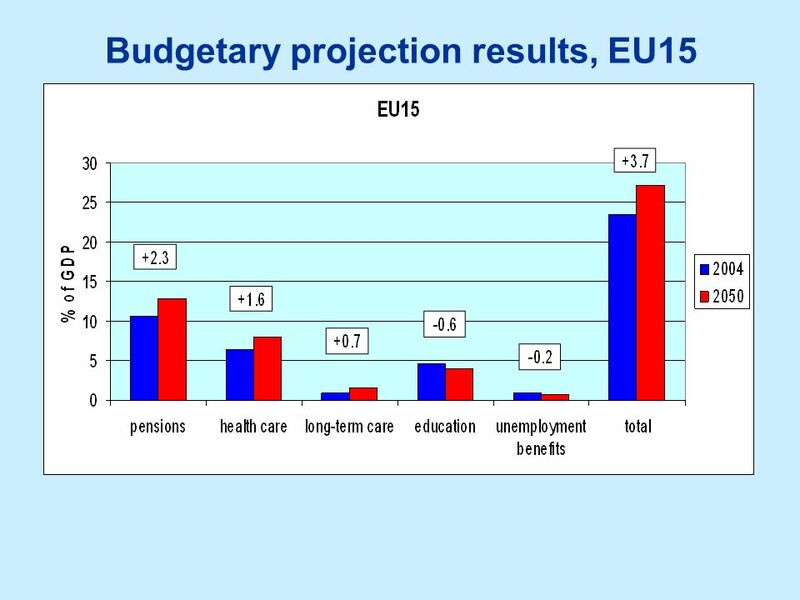 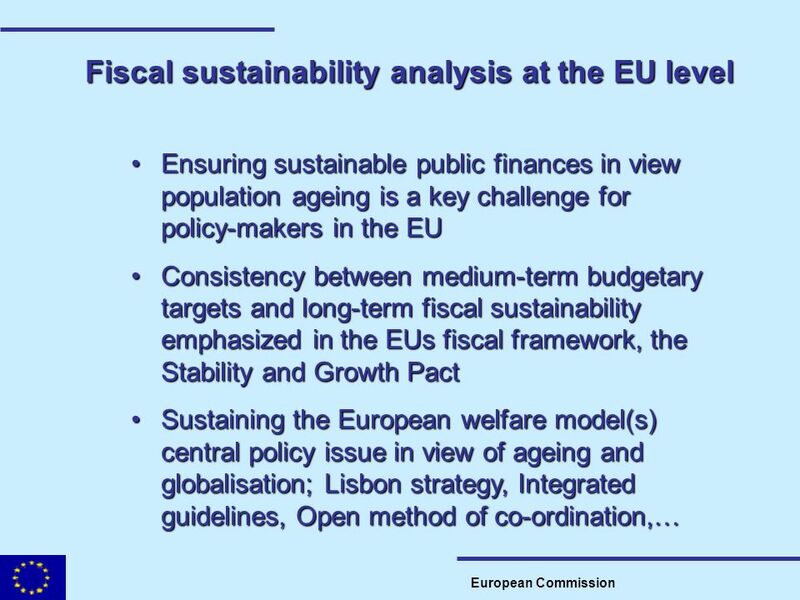 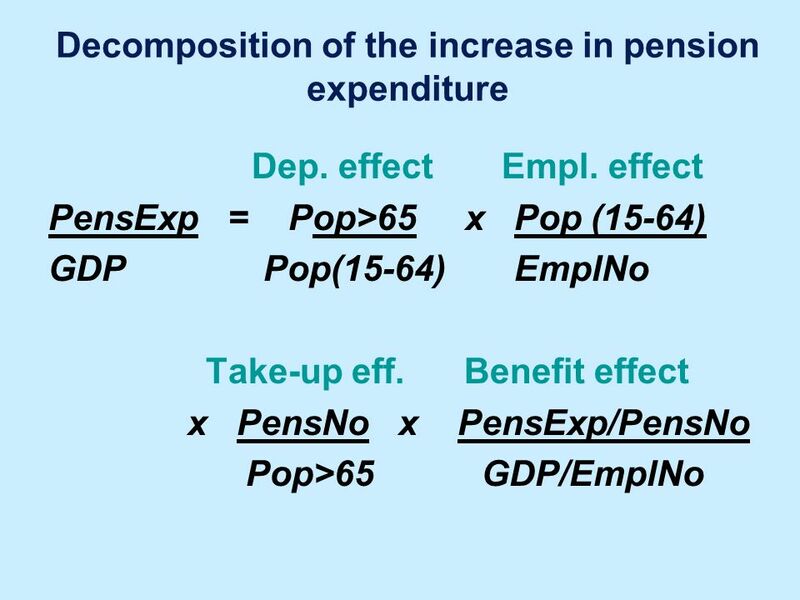 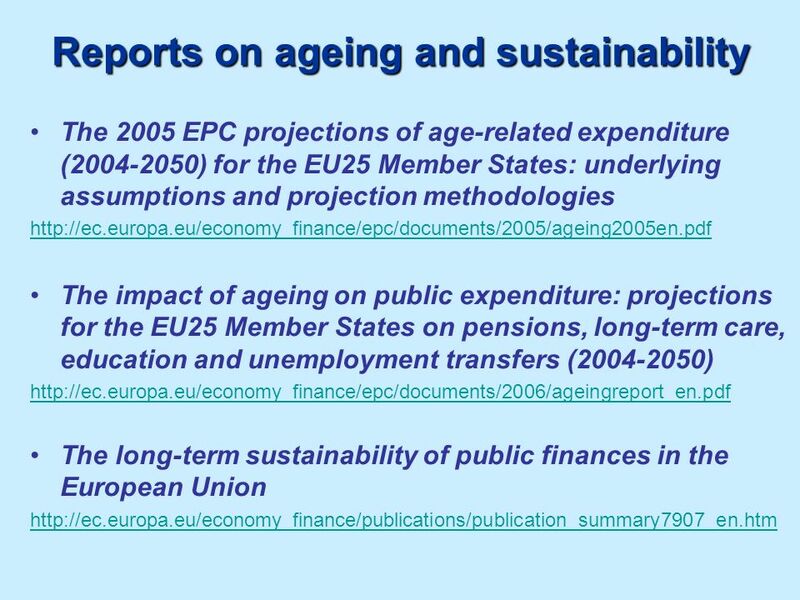 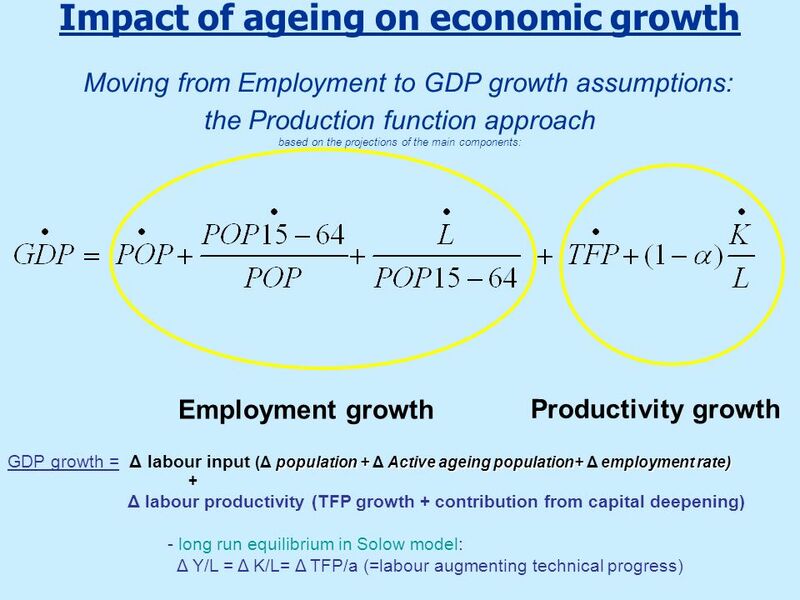 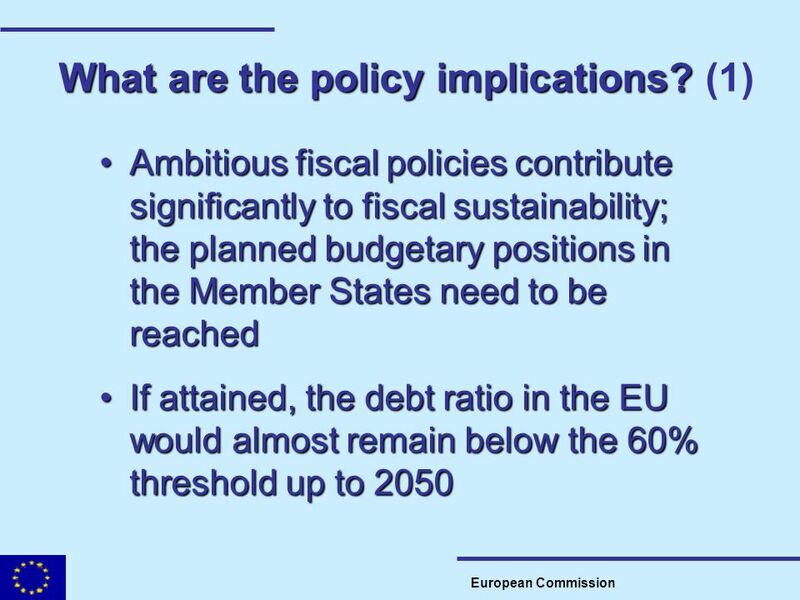 Three main features of the methodology Use of entry rates and exit rates 2) Participation rates are projected for each single year of age and gender 3) Incorporate the impact of pension reforms Now We can move to the main features of the methodology used for the labour force projections. 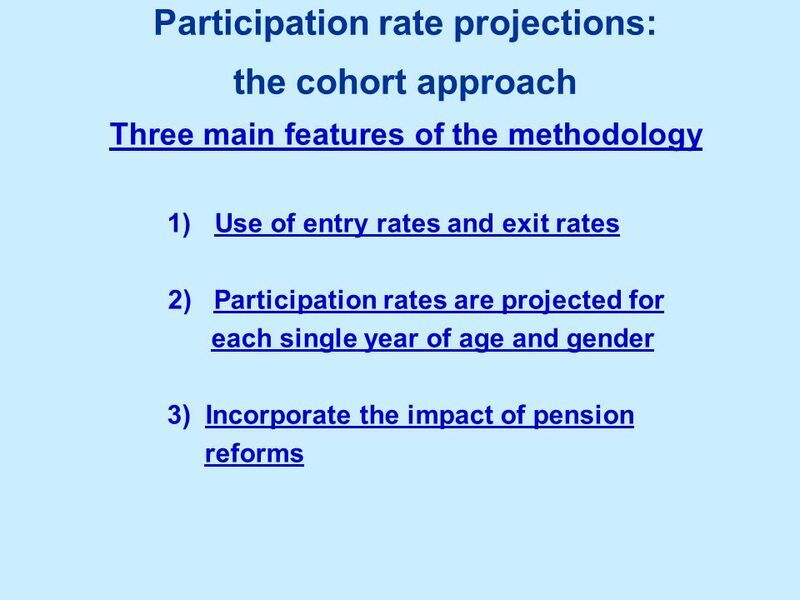 For the the projection of participation rates we have used the cohort method applied to participation rates for each single year of age, since age 15 and up to 71. 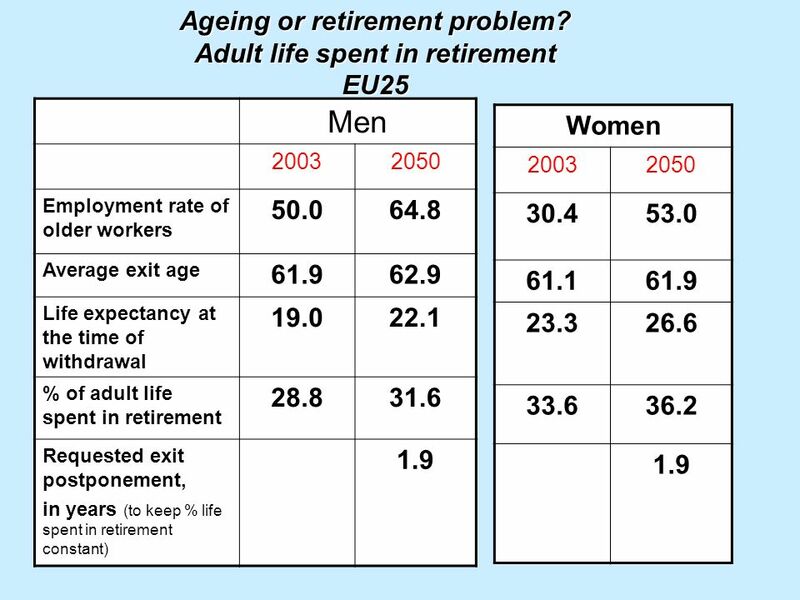 For this we have calculate for each single year of age from age 15 to age 71, the entry rates and the exit rates for the period Then we have used an average of these rate in order to get rid of cyclical influences and measurement errors. 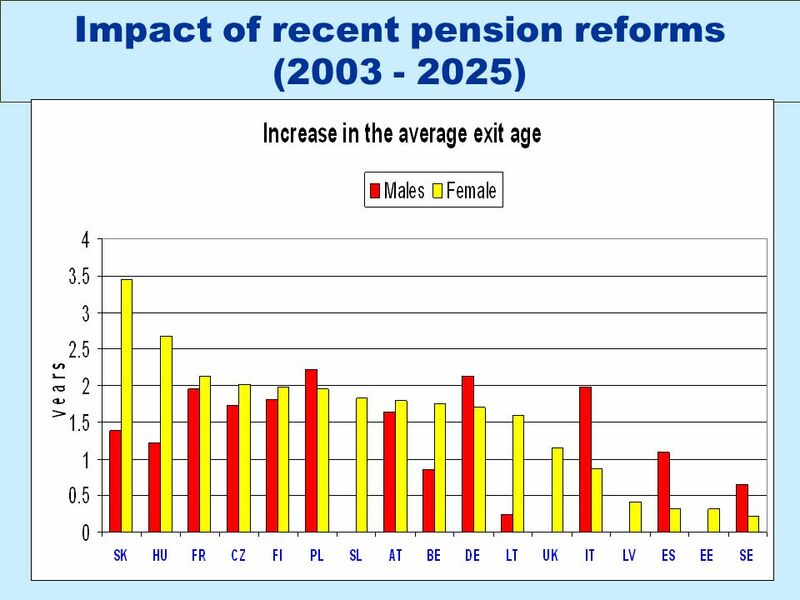 The PR projections are produced by applying these fixed entry and exit rate over the period The cohort approach used in the simulation tends to produce an autonomous increase of female participation – referred to as a “cohort effect” - corresponding to the gradual replacement of currently older women by younger women. 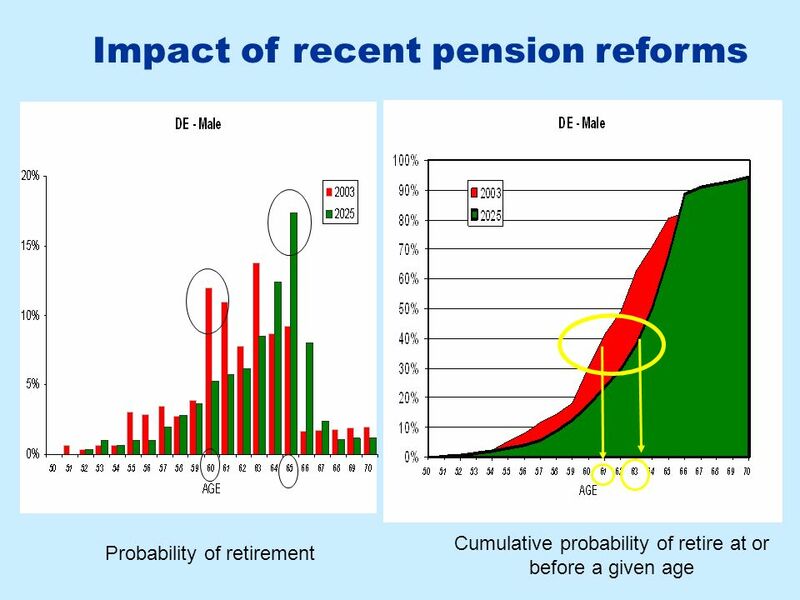 An important feature of the projection is that this basic cohort approach has been complemented by additional calculation to incorporate the impact of recent pension reforms on PRs of older workers in 17 MSs. 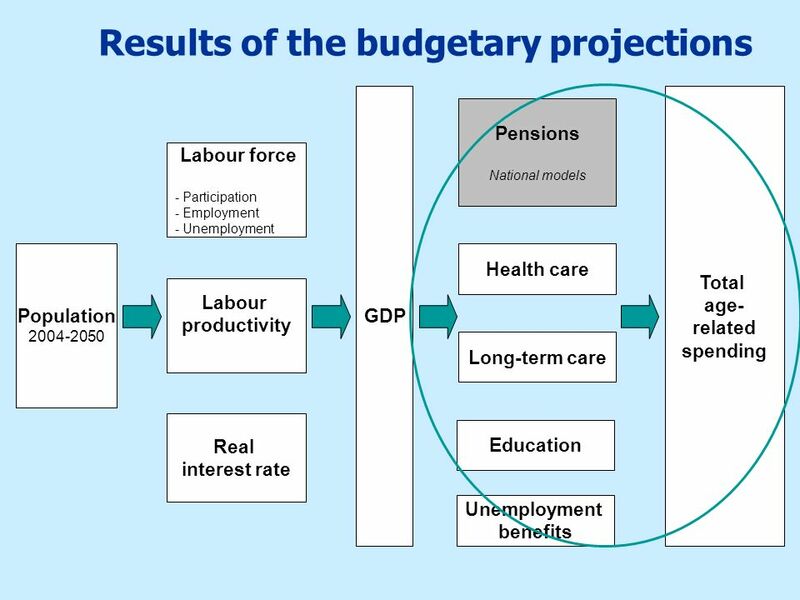 Let’s see in a bit more detail the methodology used for assessing this impact on PR. 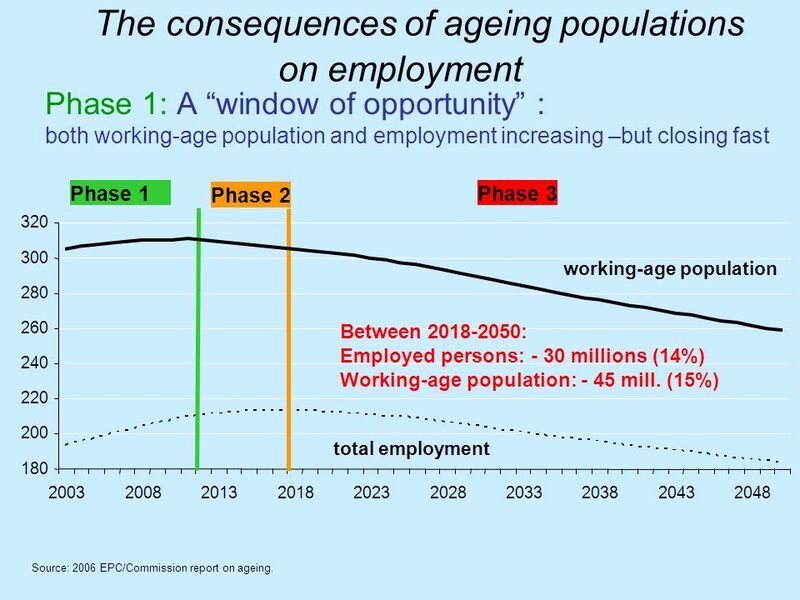 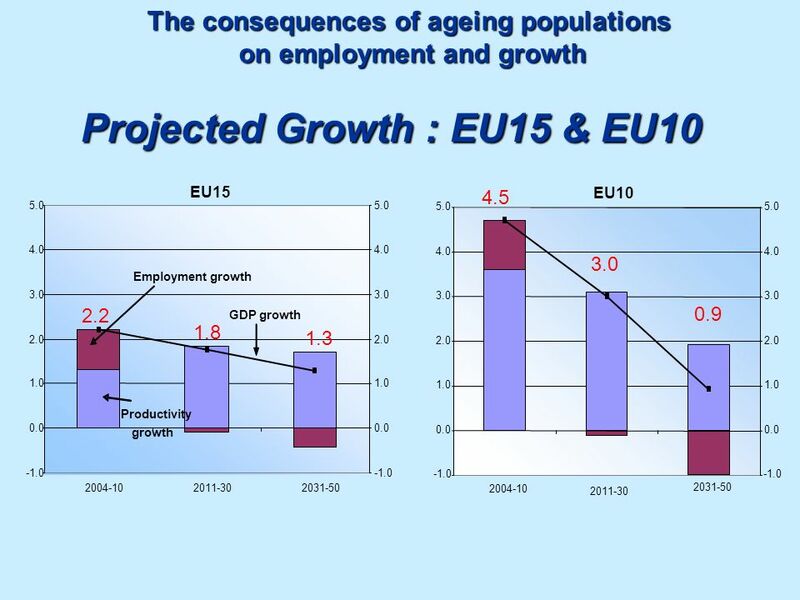 Phase 1: A “window of opportunity” : both working-age population and employment increasing –but closing fast Phase 1 Phase 2 Phase 3 320 300 working-age population 280 260 Between : Employed persons: - 30 millions (14%) Working-age population: - 45 mill. 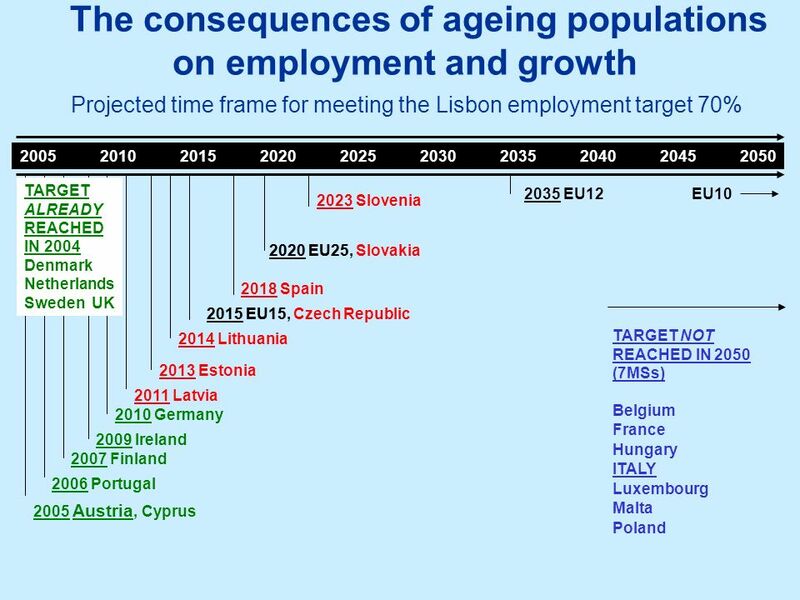 (15%) 240 220 200 total employment 180 2003 2008 2013 2018 2023 2028 2033 2038 2043 2048 Source: 2006 EPC/Commission report on ageing. 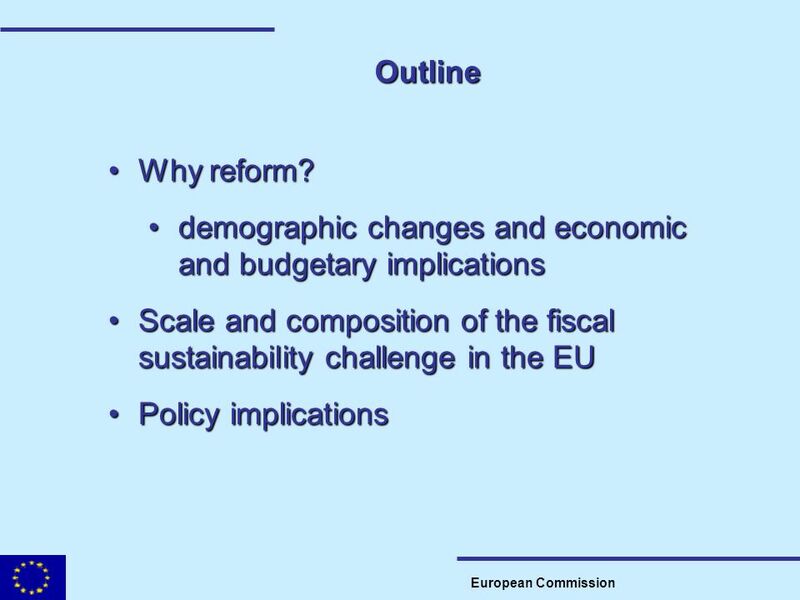 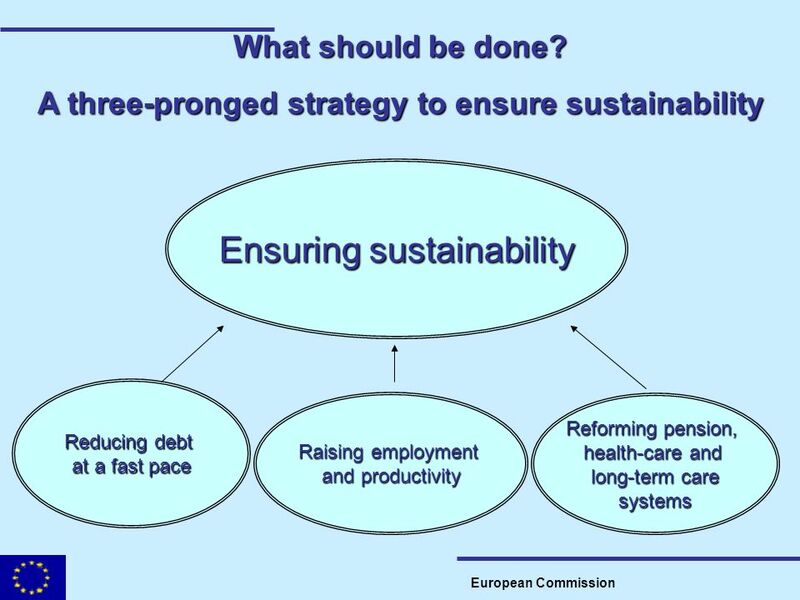 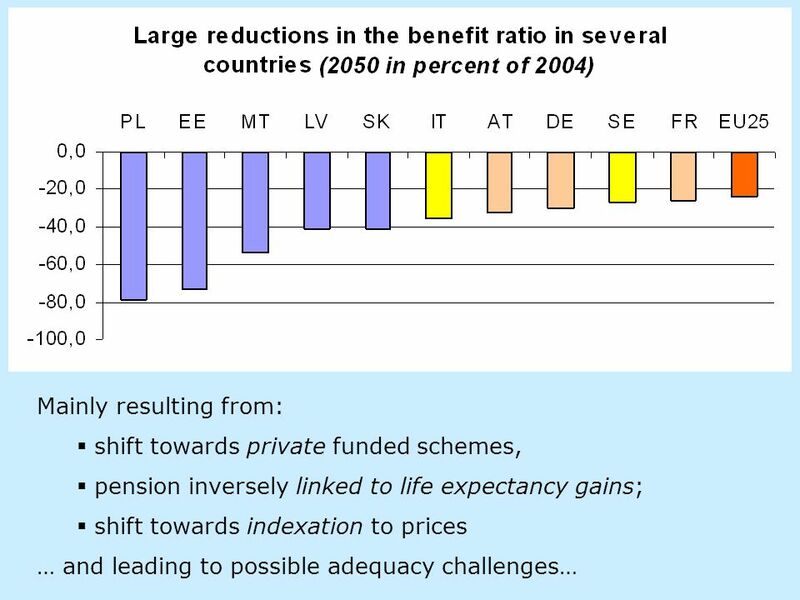 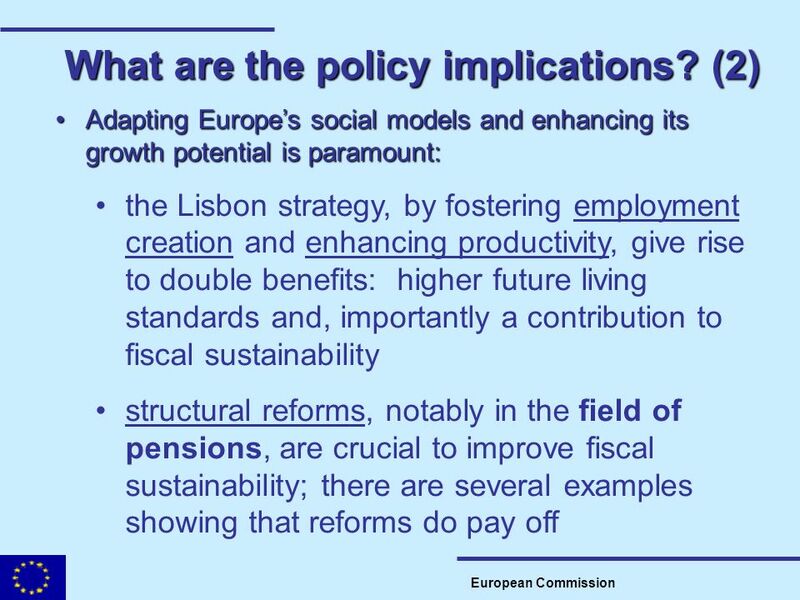 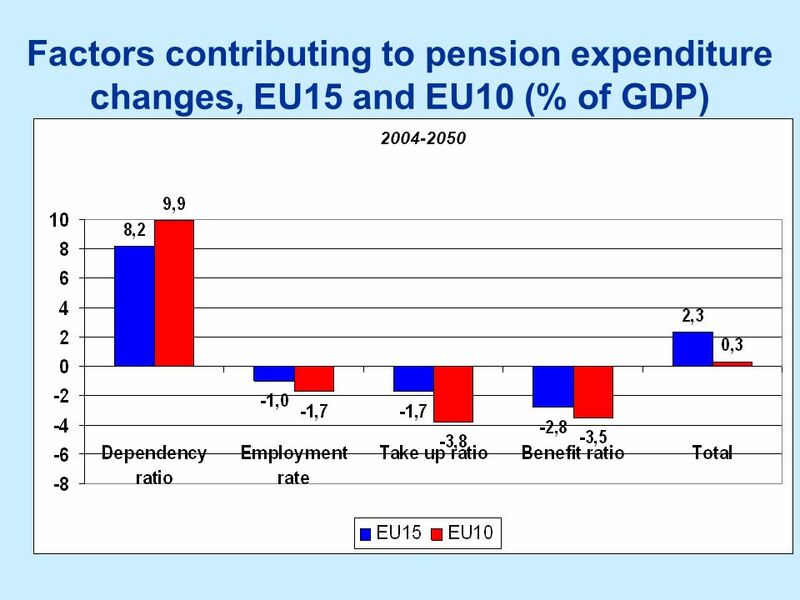 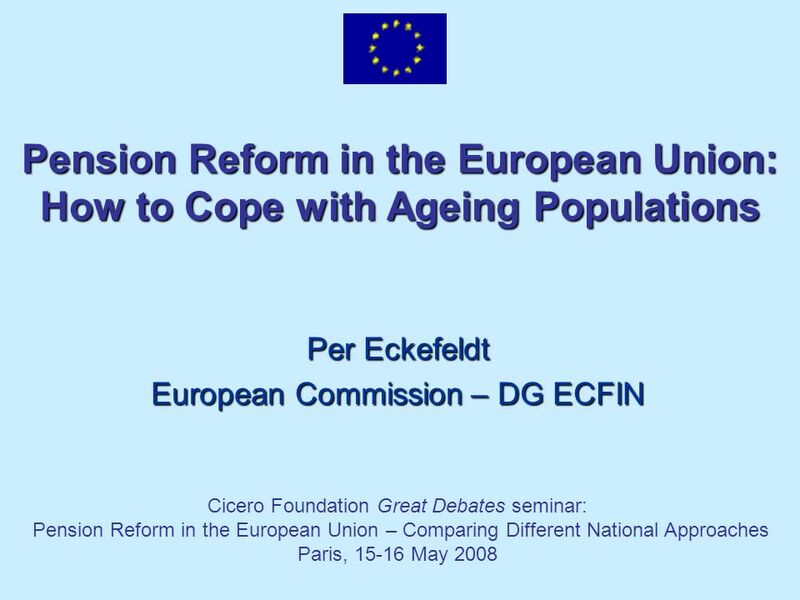 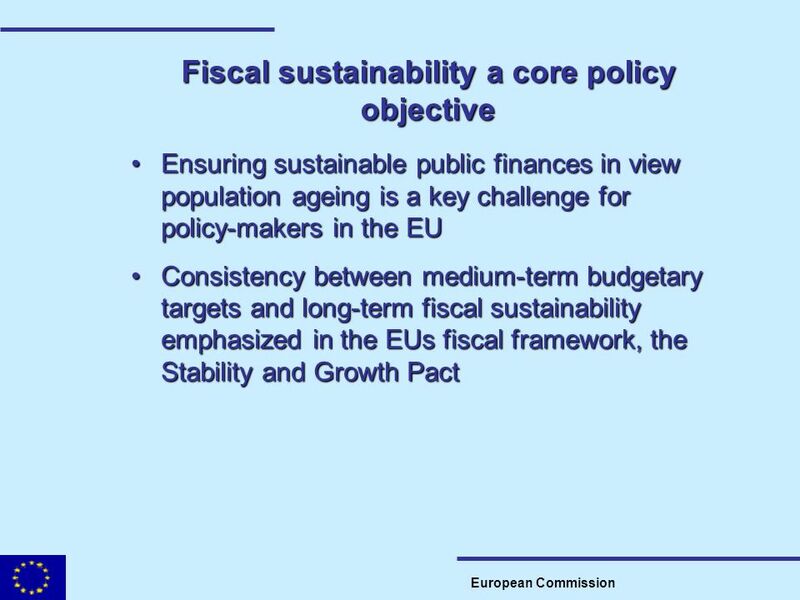 Download ppt "Per Eckefeldt European Commission – DG ECFIN"
1 Promoting Adequate and Sustainable Pensions through the Open Method of Coordination Presentation by the European Commission Tallinn, 12 November 2003. 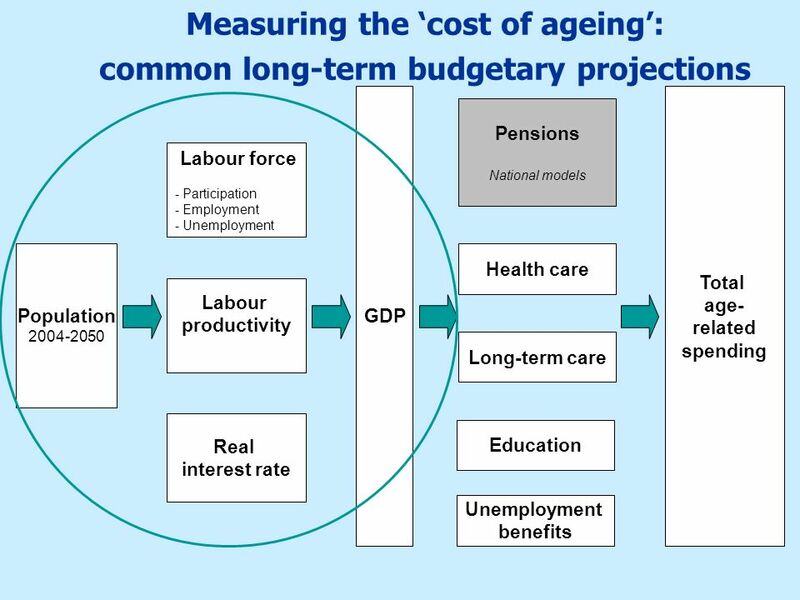 Long term public spending trends* John Hawksworth Head of Macroeconomics PricewaterhouseCoopers March 2006 *connectedthinking.